Interferometric Optics recognizes that interference is the essence of contemporary optics. Interferometric Optics focuses on interferometric solutions for science, medicine, engineering, and industry. Emphases are on research and the combination of research and development. However, broader expertise bridges from theory to experiment, from experiment to prototype, and from prototype to early production. In the area of interferometry: we specialize in interferometric imaging, interferometric microscopy, very large N-slit laser interferometers, quantum interferometry, and in secure space-to-space interferometric communications. Furthermore, we conduct cutting-edge research and development in generalized multiple-prism optics directly applicable to astronomical instrumentation and the design of dispersive cavity architectures for high-power tunable lasers and miniature narrow-linewidth tunable lasers. 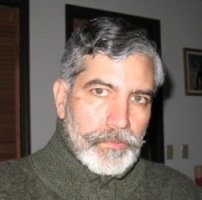 Interferometric Optics was founded in 2006, by Dr. F. J. Duarte, and is registered in Monroe County, New York, USA. In our research associates team we integrate the knowledge and expertise of several world-class experts in lasers, optics, and optical materials. We also collaborate, and work with, top US optics manufacturers. About our cover image 1: this is a digital version of a Fabry-Perot interferogram originally captured using silver-halide photographic film. The interferogram illustrates single-longitudinal-mode emission from a high-power multiple-prism grating solid-state tunable laser. 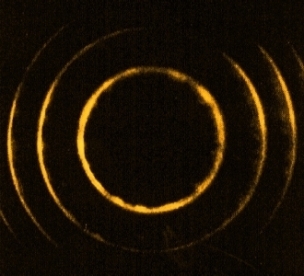 This and more interferometric images can be found in F. J. Duarte, Tunable Laser Optics, Second Edition (CRC, New York, 2015). About our cover image 2: this is an extremely elongated Gaussian beam (with a ~ 30 µm height, at its center, and a 60 mm width) used as illumination source in the NSLI. The last stage in the multiple-prism beam expansion array is shown at the lower left. Note: the beam in this image appears much higher due to saturation in the detector array capturing the image. Published on the 5th of May, 2006; updated on the 20th of March, 2017.